This map isn't part of any series, but we have other world maps that you might want to check out. Here is the famous Gomberg Map, produced by Maurice Gomberg, of Philadelphia. Mr. Gomberg created this map before an allied victory in WWII was assured, but he forecasts a post-war "New World" featuring a "quarantined" Japan, Germany, and Italy and an agreeable division of most of the war's contested areas into British, Soviet, and U.S. spheres of control. 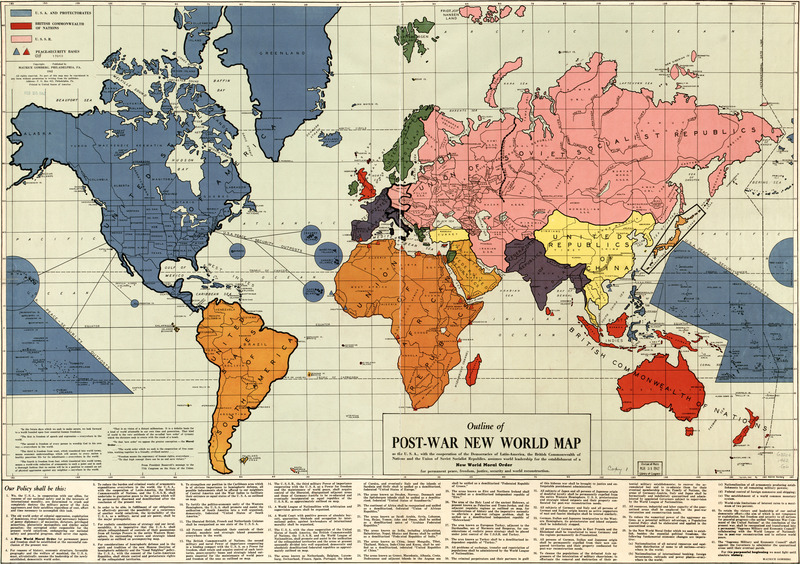 With a tone that can only be described as credulous optimism the map describes how these three emergent superpowers (USA/USSR/British Commonwealth), in cooperation with "the democracies of Latin-America", were to create a "New World Moral Order", establishing "...permanent peace, freedom, justice, security and world reconstruction." 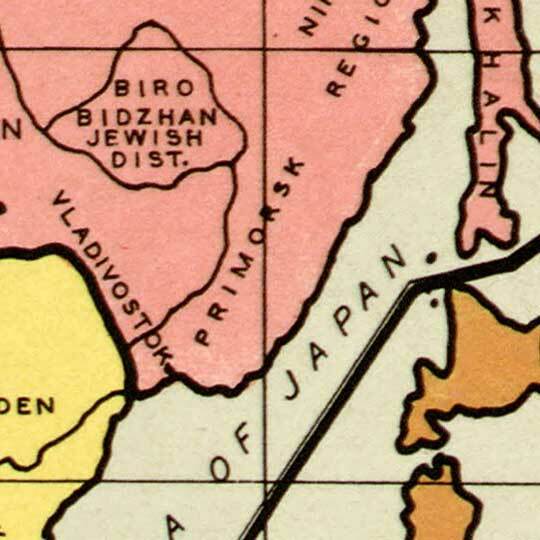 To modern sensibilities the map has a naïve, "outsider" charm. A close reading of Gomberg's verbose 41-point-plan unearths quite a trove of insight into the author's worldview. This guy missed out on a career as a game-designer or writer of alternate-history fiction -- he clearly has the temperament for it. Featured prominently -- above the bottom-margin manifesto, and west of Chile -- is a long excerpt from Roosevelt's Four Freedoms speech, exhorting the world towards the construction of a "Moral Order". In language typifying the atmosphere of mid-century exuberance, the viewer is reminded that "[This] is no vision of a distant millennium. It is a definite basis for a kind of world attainable in our own time and generation." Gomberg was not alone in having been inspired by FDR's brand of progressive humanism; Norman Rockwell's meditations on the Four Freedoms produced some of his most iconic and instantly-recognizable work for the Saturday Evening Post. While it's easy to see how one might become taken by such notions, the benefit of hindsight reveals the callow optimism propping up these kind sentiments. Far from being on the doorstep of an era of cooperation and uncontested prosperity, we were about to begin a difficult post-war process of reconstruction dominated by two superpowers with contentious and oppositional views on how best to secure such freedoms. The map is quite famous and turns up often among theorists and proponents of the ever-growing family of New World Order conspiracies, more often than not mis-attributed as a document produced by some government department or another and representing some sort of actionable plan for restructuring. The reality, of course, is that this was simply the product of an enthusiastic amateur, and that it was by little more than chance that it happened to contain some of the terminology ("New Order", "New World Order"), that was to become invested with significant meaning and putative significance by various right-wing populist movements in the 80s and 90s. Even stripped of this eschatological significance, the map remains of keen interest as a snapshot of one man's aspirations for the world, at one point, in what seems like a more optimistic time. Gomberg offered his self-published map for sale by advertising in several periodicals. Below you'll find such an ad; reprinted from a 1944 issue of the magazine "Survey Graphic". hah. we are a republic in name only, I know what you mean man. here is information on privacy.